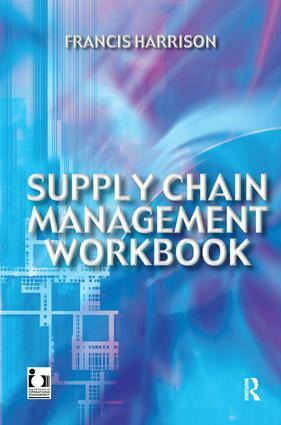 'Supply Chain Management Workbook' provides an overview of the supply chain process and addresses the key aspects involved in a supply chain. A checklist is included to enable an assessment of a company's procedures and the facilities it offers. By working through this list of questions the weaknesses in the management of the supply chain can be identified and subsequently addressed. The combination of theoretical underpinning along with a means of self evaluation results in a practical guide which will be invaluable for companies wishing to improve their supply chain management. Published in Association with The Institute of Operations Management, http://www.iomnet.org.uk. "Anyone associated with, or working within, the supply-chain sector, would benefit from owning a copy of this excellent and brilliant workbook. It has been thoroughly researched, written and well presented by Francis Harrison. …a useful starting point by clearly signposting the way forward and highlighting any weak spots relating to the understanding of supply-chain matters. …this workbook will not let the proactive and positive person - or company - down." The end customer; Manufacturing in essence; Changing market forums-internet; Mass customization; What is forecasting? ; Customer order management; What is demand management? ; The master production schedule; Shop floor control; Purchasing; Logistics; Distribution resource planning; Supply chain management workbook: checklist - Understanding the customer; Manufacturing (historical perspective); E-commerce strategy assessment; Product development overview; The mass customization journey; Forecasting made easier; Customer order management; Demand management principle objectives; Master production schedule; Enterprise resource planning (ERP) potential benefits; Rethinking the importance of the shop floor; Purchasing strategy suggestions; Supplier partnering principles; Logistics management; Distribution resource planning.